This is a SKSE plugin that opening menu will not pause game like dark souls and bloodborne,give you a smoother game experience.Gone are the days when you opened menu to eat one thousand donuts while you were dying. - Fixed an issue where binding hotkey in MCM menu sometimes causes CTD. - Fixed an issue where trading items with follower causes CTD randomly. - Fixed an issue where transterring items too fast in ContainerMenu causes CTD randomly. - Rearrange menu depth to avoid some freeze issues. - Make some optimizations on ContainerMenu's code of transfering items to improve processing speed. - Some optimizations on DialogueMenu(Beta). - Make Sleep/Wait menu unpaused too. - Fixed some console commands which cause game freeze. - Fixed issue where sleeping when you serve in jail causes game freeze. - Fixed issue where loading a save that lacks some esp files form system menu causes game freeze. - Fixed issue where book content can't be loaded completely under some conditions when you open book menu. - Fixed under some conditions clicking button in message box menu causes game freeze. - Fixed potential risk that causes CTD when you close book menu. - Fixed issue where getting caught when pickpocketing causes game freeze. - Add a misc option "FadeOutDist",this option determins the maximum distance between you and the target where ContainerMenu keeps open when you try to pickpocket a NPC.If you set the value below 200, this feature will be disabled. - Fix Quit button in system menu will be disabled when you are died.Now, Load and Quit button will be always enabled. - Redifine papyrus function Utility.Wait(),now this function will be blocked until closing menu if any unpaused menu is open.This will solve many issues like bookshelves can't be updated when closing menu ,compatibility issues with UIExtensions and so on.Now you don't need to download the patch with UIExtensions,If you have installed it,no need to remove it,it's harmless.I don't want to change this function,but I have to make a concession on skyrim modding status because I can't make pacthes for them one by one. - Make some optimizations on favorites menu to fix some potential freeze issues. - Fix cursor will be disabled that you can't choose anything in some condition. - Fix CTD when turn page in book menu,now book menu should work normally. - Fix load save button in system menu is disabled when you are died. - Provides a compatibility patch for UIExtensions.Some mods that use UIExtensions like AddItemMenu,EFF will need this patch to work as expected. - Fix can't load save when using controller. - Remove some debug log that I forgot to remove in previous version. - Fix dying with magic menu open will cause game freeze. - Fix can't perss I to close inventory and P to close magic menu. - Fix when you trade with merchant,the merchant always walks away. - Now,when you trade or train,the dialogue menu will be hide rather than being closed. - Fix inventory menu's carryweight info can't be updated immedially. - Fix dialogue menu will override other menus when other unpaused menu is open. - Now auto save will be disabled when umpaused menu is open to avoid freeze. - Fix some small issues when using controller. -Fix favorites menu doesn't work normally in V1.0.1.3. - Fix can't switch in container menu when using controller. - Fix can't assign hotkey in favorites menu when using controller. - Fix 3D model doesn't appear in inventory menu and magic menu. - Fix training menu that doesn't work normally. - Fix carema doesn't follow player with tween menu open. - Fix game freeze when exit inventory menu in some conditions. All menus won't pause game except two fullscreen menus(MapMenu and StatsMenu).This plugin takes effect on custom menu like UIExtensions too.You can open INI file to config every menu. This plugin also exports a console command([SetSkyrimSoulsVariable OptionName Value] or [sssv OptionName Value]) to change settings at runtime,for example,"sssv Console 0" will set Console to paused state.You had better not change menu configuration through Console when corresponding menu is open except console menu. 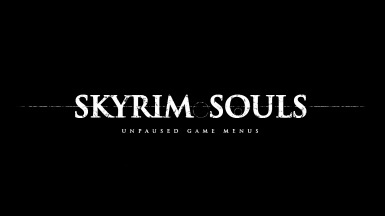 This plugin is a redone version of Zebrina's SkySouls - Unpaused Game Menus.I have tracked it since it just got released,and there are a few annoying bugs that did't get fixed for some time,so I redone the whole work and fixed every bug I met. Zebrina for her great idea and great work on SkySouls. SkyUI team for SkyUI and Unoffical SkyrimUI SDK.